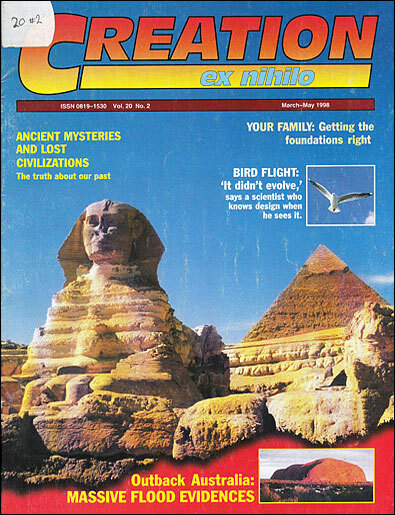 Editor’s note: As Creation magazine has been continuously published since 1978, we are publishing some of the articles from the archives for historical interest, such as this. For teaching and sharing purposes, readers are advised to supplement these historic articles with more up-to-date ones suggested in the Related Articles below. No visit to Central Australia is complete without seeing two of Australia’s most famous landmarks—Uluru (Ayers Rock) and Kata Tjuta (the Olgas). These geological formations are stunning in their beauty, and awesome in their abrupt contrast to the surrounding flat, barren plains. Uluru rises steeply on all sides to a height of about 340 metres (1,114 feet) above the desert plain, its summit 867 metres (2,845 feet) above sea level. An isolated rock-mass, it measures nine kilometres (5.6 miles) around its base. 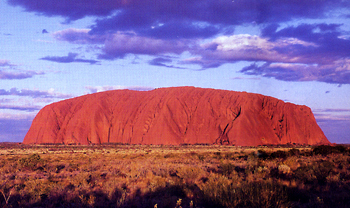 Uluru may look like a giant boulder sitting in the desert sand, but it is not (Figure 2, below). Instead, it is like the ‘tip of the iceberg’, an enormous outcrop with even more of the same rock under the ground and beneath the surrounding desert sand. Uluru consists of many layers or beds of the same rock tilted and standing almost up on end (dipping at 80–85°). The cumulative thickness of these exposed beds is at least 2.5 kilometres (1.6 miles), but the additional layers under the surrounding desert sand bring the overall thickness to almost six kilometres (3.75 miles). Uluru consists of a type of coarse sandstone known technically as arkose, because a major component is grains and crystal fragments of the mineral feldspar. This pink mineral, along with the rusty coatings on the sand grains in the rock surface generally, gives Uluru its overall reddish colour. Closer inspection of this arkose reveals that the mineral grains are fresh in appearance, particularly the shiny faces of feldspar crystals, some quite large. The rock fabric consists of large, medium, small, and very small grains randomly mixed together, a condition geologists describe as ‘poorly sorted’ (see photomicrograph). Furthermore, the grains themselves are often jagged around their edges, not smooth or rounded. Kata Tjuta, about 30 kilometres (18 miles) west of Uluru, consists of a series of huge, rounded rocky domes (Figure 3, below). The highest, Mt Olga, reaches 1069 metres (3,507 feet) above sea level and about 600 metres (1,970 feet) above the desert floor. 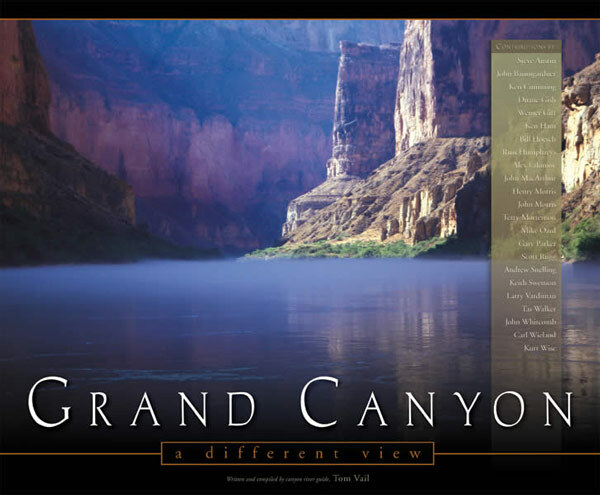 Separated by narrow gorges, these spectacular domed rock-masses cover an area of about eight kilometres (five miles) by five kilometres (three miles). The rock layers here only dip at angles of 10–18° to the southwest, but are enormous. Their total thickness is six kilometres (3.75 miles), and they extend under the desert sands to other outcrops for over 15 kilometres (9.5 miles) to the north-east and for more than 40 kilometres (25 miles) to the north-west. These rock layers making up Kata Tjuta are collectively called the Mount Currie Conglomerate, named after the outcrop at Mount Currie, about 35 kilometres (22 miles) north-west of Kata Tjuta. A conglomerate is a poorly sorted sedimentary rock containing pebbles, cobbles, and boulders of other rocks held together by a matrix of finer fragments and cemented sand, silt, and/or mud. In this one, the boulders (up to 1.5 metres or five feet across), cobbles, and pebbles are generally rounded and consist mainly of granite and basalt, but some sandstone, rhyolite (a volcanic rock), and several kinds of metamorphic rocks are also present. The matrix is mostly dark greyish-green material that was once fine silt and mud, though lenses and beds of lighter coloured sandstone also occur. The Uluru Arkose and the Mount Currie Conglomerate appear to be related by a common history. Though their outcrops are isolated from one another, the evidence clearly suggests that both rock units were formed at the same time and in the same way. Figure 2. Cross-section through Uluru showing the tilted layers of arkose continuing under the surrounding desert sand. Figure 3. Cross-section through Kata Tjuta showing the slightly tilted layers of Mount Currie Conglomerate. Most geologists believe that between about 900 and 600 million years ago, much of Central Australia lay at or below sea-level, forming a depression, an arm of the sea, known as the Amadeus Basin. Rivers carried mud, sand, and gravel into the depression, building up layers of sediment. Other types of sedimentary rocks also formed. Then, they say, about 550 million years ago, in the so-called Cambrian Period, the south-western margin of the Amadeus Basin was raised above sea-level, the rocks were squeezed, crumpled and buckled into folds, and fractured along faults in a mountain-building episode. During the later stages of this episode, ‘rapid’ erosion carved out the Petermann and Musgrave Ranges. The Uluru Arkose and Mount Currie Conglomerate are the products of this erosion, being deposited in separate so-called alluvial fans (Figure 4A). Though uniformitarian (slow-and-gradual) geologists believe the arkose and conglomerate were deposited ‘relatively rapidly’, they still allow up to 50 million years for the occasional flash floods to have scoured the mountain ranges south and west of the Uluru area and carried the rubble many tens of kilometres out on to the adjoining alluvial flats. Thus in two separate deposits, layer upon layer of arkose and conglomerate accumulated respectively. By about 500 million years ago, it is claimed, the region was again covered by a shallow sea and the alluvial fans of Uluru Arkose and Mount Currie Conglomerate were gradually buried beneath layers of sand, silt, mud and limestone (Figure 4B). 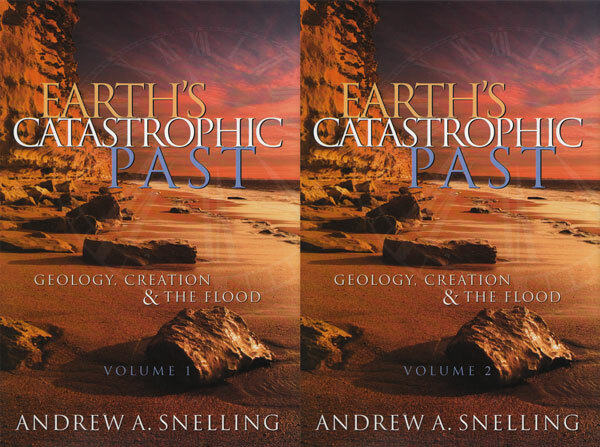 Then about 400 million years ago a new period of folding, faulting and uplift began and supposedly continued for around 100 million years. The layers of Uluru Arkose and Mount Currie Conglomerate, which had been buried by hundreds or even thousands of metres of younger Amadeus Basin sediments, were strongly folded and faulted (Figure 4C). The originally horizontal Uluru Arkose layers were rotated into a nearly vertical position, while the Mount Currie Conglomerate at Kata Tjuta was only tilted 10–18°. It is thus believed that the Uluru-Kata Tjuta area has probably remained above sea-level since that time—for some 300 million years. Initially the land surface would have been much higher than the top of Uluru and Kata Tjuta, but as erosion continued, today’s shapes of Uluru and Kata Tjuta were gradually carved out (Figure 4D). By 70 million years ago the area was covered in forests indicating a very wet, tropical environment. 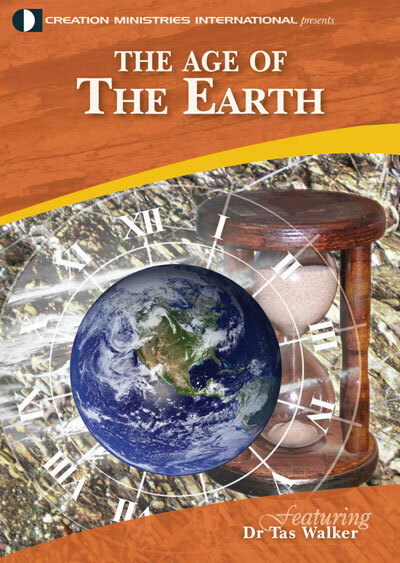 Today’s arid climate and desert sands have only developed since the very recent ‘ice age’, a few thousand years ago. Figure 4. The likely geological history or sequence of events leading to the formation of Kata Tjuta and Uluru (irrespective of any evolutionary assumptions). A. The ‘alluvial fans’ of Mount Currie Conglomerate (left—red) and Uluru Arkose (right—yellow) deposited on a basement of folded and eroded earlier sediments (orange) and granites (grey-green). B. The Mount Currie Conglomerate and Uluru Arkose are buried by other sediments (blue). C. The sediment layers are folded, faulted, tilted and then eroded. D. Further erosion lowers the ground surface still more and carves out Kata Tjuta and Uluru as they are today. Now that all sounds like an interesting story, but in fact, the evidence in these rock layers doesn’t agree with it! At Uluru particularly, the ubiquitous fresh feldspar crystals in the arkose would never have survived the claimed millions of years. Feldspar breaks down when exposed to the sun’s heat, water, and air (e.g., in a humid tropical climate), and relatively quickly forms clays. If the arkose was deposited as sheets of sand only centimetres (an inch or two) thick spread over many tens of square kilometres to dry in the sun’s heat over countless thousands of years, then the feldspar crystals would have decomposed to clays. Likewise, if the arkose had been exposed to the destructive forces of erosion and tropical deep chemical weathering even for just a few million years, as is claimed, then the feldspar crystals would have long ago decomposed to clays. Either way, the sandstone fabric would have become weakened and then collapsed, as the clays and remaining unbound mineral grains would have easily disintegrated and been entirely washed away, leaving no Uluru at all! Furthermore, sand grains which are moved over long distances and periodically swept further and further over vast eons of time would lose their jagged edges, becoming smooth and rounded. At the same time, the same sand grains being acted upon by the moving water over those claimed long periods of time should also be sorted; the smaller grains are carried more easily by water, so would be separated from the larger grains. Thus if the Uluru Arkose had taken millions of years to accumulate as evolutionary geologists claim, then the rock today should have layers of either small or large grains. So fresh, shiny feldspar crystals and jagged, unsorted grains today all indicate that the Uluru Arkose accumulated so rapidly the feldspar did not have enough time to decompose, nor the grains to be rounded and sorted. What of the Mount Currie Conglomerate? Even geologists who believe in slow-and-gradual sedimentation over millions of years have to admit that the waters which carried such large boulders (some over 1.5 metres or five feet across) had to be a swiftly-flowing, raging torrent. Such catastrophic conditions would also need to be widespread in order to erode such a variety of rock types from the large mountainous source region, and to produce the resultant mixture of particle sizes—from mud (pulverized rock) and silt to pebbles, cobbles, and boulders which, because of their size, were also rounded and smoothed by the violence of their rapid transport over tens of kilometres. All this evidence is far more consistent with recent catastrophic deposition of the arkose and conglomerate under raging flood conditions. In the exposures at Uluru and Kata Tjuta respectively, the rock compositions and fabrics are uniformly similar throughout (2.5 kilometres or 1.6 miles thick in the case of Uluru) and the layering extremely regular and parallel. If deposition had been episodic over millions of years, there ought to be evidence of erosion (e.g., channels) and weathering surfaces between layers, while some compositional and fabric variations would be expected. The implications are absolutely staggering. One only has to consider the amount and force of water needed to dump some 6,000 metres (almost 20,000 feet) thickness of sand, and a similar thickness of pebbles, cobbles, boulders, etc., probably in a matter of hours, after having transported these sediments many tens of kilometres, to realise that such an event had to be a catastrophic flood. And this traumatic event had to be recent, otherwise the feldspar crystals in the arkose would not be as fresh (unweathered) as they are today. The Uluru Arkose as seen under a geological microscope. Note the mixtures of grain sizes and the jagged edges of the grains. Since the layers of arkose and conglomerate are now tilted, the arkose almost vertically, it is also obvious that after being deposited these sediment layers were compressed and began to be cemented (hardened) while still water-saturated, and then pushed up by earth movements. Those experts in landscape-forming processes, who have intensively studied Uluru, Kata Tjuta, and other Central Australian landforms, are convinced that these shapes were carved out by water erosion in a hot, humid tropical climate, and not by wind erosion as in today’s dry desert climate. 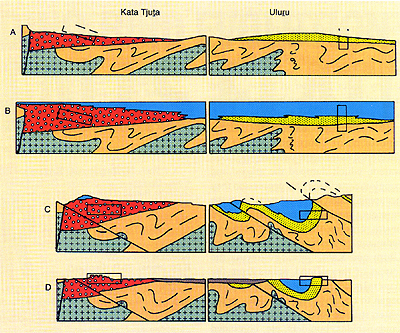 This is easily explained if the modern landforms of Uluru and Kata Tjuta developed as the same catastrophic flood waters, which dumped the arkose and conglomerate in the vast depression they occupied, began to retreat away from the emerging land surface of rising, tilted layers, eroding the still relatively soft sediments to leave behind the shapes of Uluru and Kata Tjuta. Following the retreat of those flood waters from the Australian continent, the landscape began to dry out. The chemicals in the water still trapped between grains of sand, pebbles, boulders, etc. continued to form a binding and hardening material similar to cement in concrete. The evidence overall does not fit the story of evolutionary geologists, with its millions of years of slow-and-gradual processes. Instead, the evidence in the rock layers at Uluru and Kata Tjuta is much more consistent with the scientific model based on a recent, rapid, massive, catastrophic flood, such as that of Noah’s day. Uluru and Kata Tjuta are therefore stark testimony to the raging waters of the global Flood, as in the eye-witness record in the book of Genesis. D.J. Forman, Ayers Rock, Northern Territory, 1:250,000 Geological Series, Bureau of Mineral Resources, Australia, Map plus Explanatory Notes, 1965. W.K. Harris and C.R. 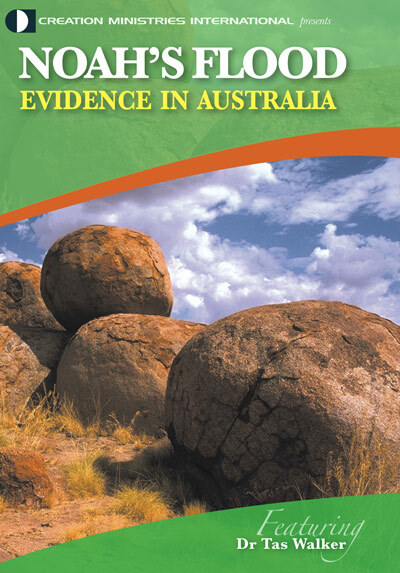 Twidale, Revised age of Ayers Rock and the Olgas, Transactions of the Royal Society of South Australia 115:109, 1991. C.D. Ollier and W.G. Tuddenham, Inselbergs of Central Australia, Zeitschrift für Geomorphologie Neue Folge 5(4):257–276, 1962. J. Selby, Ayers Rock, Geology Today 5(6):206–209, 1989. I.P. Sweet and I.H. Crick, Uluru and Kata Tjuta: A Geological History, Australian Geological Survey Organisation, Canberra, 1992. R.B. Thompson, A Guide to the Geology and Landforms of Central Australia, Northern Territory Geological Survey, Alice Springs, pp. 93–97, 1991. C.R. Twidale, On the origin of Ayers Rock, Central Australia, Zeitschrift für Geomorphologie Neue Folge Supplement 31:177–206, 1978. C.R. Twidale and J.A. Bourne, Bornhardts developed in sedimentary rocks, Central Australia, South African Geographer 6(1):35–51, 1978. C.R. Twidale and W.K. Harris, The age of Ayers Rock and the Olgas, Central Australia, Transactions of the Royal Society of South Australia 101(1):45–50, 1977. C.R. Twidale and H. Wopfner, Aeolian landforms of Central Australia: a discussion, Zeitschrift für Geomorphologie Neue Folge 25(3):353–358, 1981. A.T. Wells, D.J. Forman, L.C. Ranford and P.J. Cook, Geology of the Amadeus Basin, Central Australia, Bureau of Mineral Resources, Australia, Bulletin 100, 1970.